The Mares Essence LiquidSkin Mask is the maximum expression of LiquidSkin technology. Silicone and glass come together and blend to create a mask that is truly one of a kind. Light and foldable, it has buckles on the skirt to offer a broad field of vision. All the features are orchestrated by the exclusive design, a synthesis of technology and aesthetics. 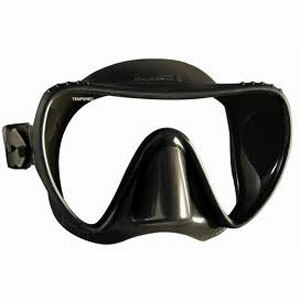 Great for Diving and Snorkelling. Fits adult small to medium faces. The most important innovation since the introduction of silicone masks, Liquid Skin is a Bi-Silicone Mares exclusive technology. Two different types of silicone: a firmer portion for support structure and a softer portion for contact with your face, 45% Softer on Skin of unparalleled comfort. 270% Greater Elasticity for a Perfect Fit. By attaching the buckles to the skirt masks have Superior Hydrodynamics because the strap fits closer to the head, in addition the tension exerted by the strap acts on the skirt and not directly the frame Reducing the Pressure of the Frame against the Face. This Low Volume Mask has a Double Feathered Edge Skirt and Quick-Adjust Buckle System attached to a Comfortable Split Style Strap. The Mask Lens is Tempered Safety Glass. The Large Easy to Reach One-Handed Nose Pocket makes Ear Equalisation a breeze even when wearing thick Gloves. LIQUIDSKIN: Patented Technology. The exclusive Bi-Silicone technology uses two different types of silicone: a firmer portion for support structure and a softer portion for contact with your face. It is 45% softer for unparalleled comfort and 270% more elastic for a perfect fit. TRI-COMFORT: This mask has small horizontal ribs between the frame and the skirt in the area around the nose. These ribs absorb and redistribute the pressure exerted by the frame onto the skirt, with a resulting increase in comfort.